A Wide Range Of Colours And Styles. 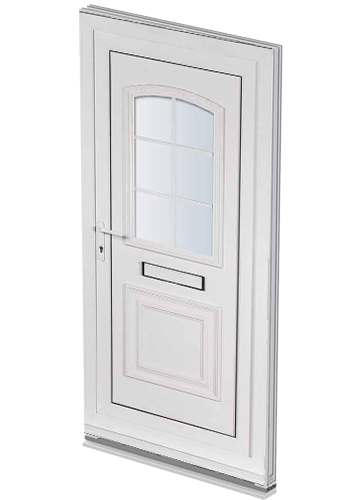 Our PVC door range comes in White, and the realistic wood effects of Oak and Rosewood, as well as a wide range of glass, lead and fret designs that will give your door the personal touch. Each individual door comes in various configurations. We offer a wide-range of conservatories, both in style and design, ensuring we have a conservatory to compliment any property such as our white, rose or light oak ranges.You want to be as secure as possible in your own home, but you don’t want to live in an ugly fortress! All door panels are available in a choice of white, mahogany, light oak or rosewood finishes colour matched to your profile. Our extensive range of authentic antique lead and bevelled glass designs will complement any style of home. That’s why ESG Limited residential uPVC doors are second to none. We ensure your doors have the strength, robustness and reliability you need to keep your home safe – without compromising on style. Our high performance uPVC doors truly enhance the look of your home. Simply choose from our wide range of styles and finishes to complement your home perfectly. All glazing complies with current building regulation requirements and includes toughened safety glass as standard and frames designed for high security. A range of high quality furniture can also be specified including letter plates, knockers, spy viewers and brass numerals to make your door as individual as your home.